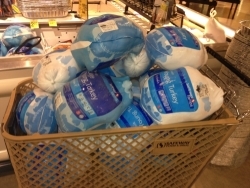 This past Saturday morning, I woke up and had an instant urge to buy two shopping carts full of frozen turkeys. Why, do you ask? 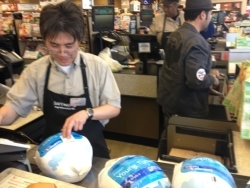 Because the night before on the internet, I had read about the annual Turkey Drive sponsored by St. Anthony’s Dining Room in San Francisco. So I went over right on over to the local Safeway and loaded up. I think that this is such an excellent way to participate in some holiday charitable donating. For over 100 years, St. Anthony’s has been providing meals & basic services to those in need. Currently, the kitchen provides over 3,000 meals a day, and is the only is the only free food kitchen in San Francisco that is open every day of the year. 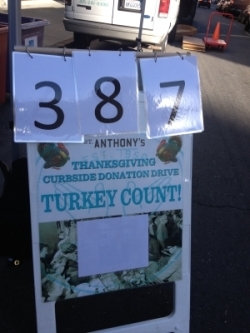 This year their Curbside Donation Drive runs through this entire week, until Thursday evening. They are accepting turkeys & pantry items, plus cold-weather wear. 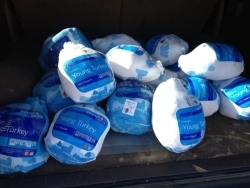 If you’re looking for a way to “give back” this holiday season, why not drop off a bunch of turkeys or other pantry items, and help a family have a Thanksgiving Dinner. It’s a really great feeling to participate in such a necessary – yet simple – way.